For security consideration, the Lemur–S offers the user a solution in terms of an internal storage of ticket stock with a maximum capacity of 4″ x 12″ x 7.5″. 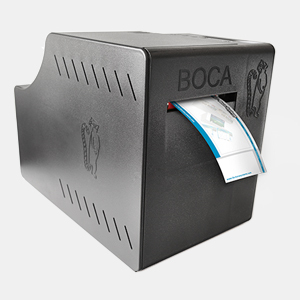 The Lemur–S provides the user with all of the major features of the known BOCA products. The printer comes as a standard with an adjustable 2″ – 3.25″ print width and serial, parallel and USB interfaces. The control panel with LCD display allows the user to easily access the printer`s Operator Menu as well as providing feedback in error conditions. All prices are in Australian Dollars and exclude GST and domestic delivery .